YOU CAN EDIT THIS PAGE! Just click any blue "Edit" link and start writing! Discussion on defining regions for Transylvania is in progress. If you know the area pretty well, please share your opinion on the talk page. Transylvania is the largest region of Romania and probably the best known one. When you visit Transylvania you dive into a mix of cultures, nature and history. Transylvania is a diverse region: it is worth trying to observe the differences that exist within the region, both culturally and naturally. This region is a place with abundant history and multicultural convergence. All over Transylvania the cohabitation of Romanians, Hungarians, Saxons and Roma is the leading theme. Transylvania is rich in myth and misty medieval sites: there about 100 castles and fortresses and about 70 fortified churches. 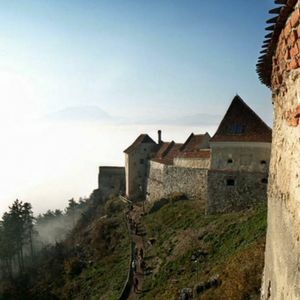 Romania's greatest and best preserved castles and fortresses are to be found here. But for the more curious traveler, there are many small villages with old houses and fortified churches. As Transylvania is circled by the Carpathian mountains there are a lot of mountain forests and hiking or climbing possibilities. All over the Carpathians there are great national parks. In the center of Transylvania there are green hills and rivers. Most big cities are very western Europe like, and the infrastructure is generally good, making it easy for travelers. 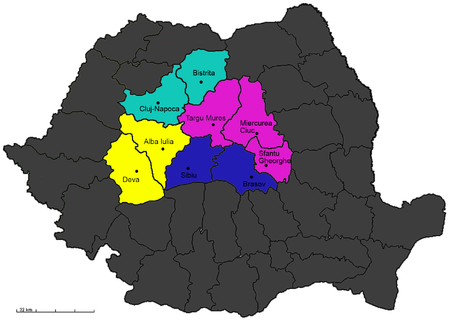 Regions in Transylvania with the capital cities of the counties. This region, with Sibiu and Brasov, has a more pronounced Saxon background. It is one of the most popular places for travelers due to its richness in fortresses (Rasnov, Bran), old towns, fortified churches in picturesque villages (Biertan, Valea Vilor, Prejmir) and mountain forests (Piatra Craiului). It is also home to some of the most important ski resorts(Poiana Brasov). The region around Sfantu Gheorghe, Miercurea Ciuc and Targu Mures has strong Hungarian cultural influences. The counties Harghita (Miercurea Ciuc) and Covasna (Sfantu Gheorghe) are also known as the Szeklerland. Here you can buy fresh bread and Kürtőskalács from locals or see the Sfanta Ana lake. Hunedoara (Deva) and Alba (Alba Iulia) are important historical sites for Romanian culture. Alba Iulia was the place where the unification of the Romanian regions took place. In this region you can see a the great Corvinesti Castle, lakes, caves and other beautiful natural sites. The main acces points to Retezat National Park are to be found here. Cluj and Bistrita Nasaud are harder to define in terms of a predominant culture. Cluj Napoca is a very important university and research city. It also has important historical and cultural landmarks. Around it there are picturesque villages (Romanian, Hungarian and German). Near Turda you can visit the imposing Turda Canyon. Bistrita Nasaud is famous for its lakes, caves, health resorts, but also historical sites. Giurtelecu Şimleului is also in this region. Rasnov fortress emerging over the misty hill. Although some people may only associate the name with tales of bloodthirsty vampires (it is the setting of Bram Stoker's novel Dracula), Transylvania is one of the most beautiful natural regions in Europe dotted with picturesque, medieval fortress towns and monasteries. Lively cities with stunning baroque architecture offer modern tourism services at a price far below that of, say, Germany or France. Here you can find some of the most developed cities in Romania, but also old villages where people live as they did a hundred years ago. Transylvania is surrounded by the misty Carpathian mountains and is home to rare fauna (bears, wolves) and flora (orchids and other plants). Transylvania has all the history and multi-ethnic culture you could want. The history of Transylvania is much disputed: once it was an integral part of the Kingdom of Hungary (950-1526), then an independent Principality (1526-1690) before being reabsorbed by the Habsburg Empire. It was united with Wallachian and Moldovia to form Romania after the Austro-Hungarian Empire was dissolved in the Treaty of Triannon, which saw the conclusion of the Great War between Hungary and the Allies. This complex history explains the many cultural differences between Transylvania and the rest of Romania. For much of this history the Romanian majority had, few rights, and were ruled by minorities such as the Hungarians and Saxons. Other minorities included Roma, Jews and Armenians. After World War I, Transylvania became part of Greater Romania. The Communist era was a harsh time for ethnic minorities, especially for those of whom many had been small business owners (Hungarians, Jews) before the totalitarian regime came to power. After the revolution in 1989, most Saxons moved to Germany (having settled in Transylvania, at that time part of the Kingdom of Hungary, in large numbers during the 13th century), and many ethnic Hungarians also left. The relations between the ethnic minorities and majority have have known tense times, but there has never been a serious conflict. Although attitudes of individuals can still be closed towards other groups, Transylvania is an example of different ethnic groups living together in relative peace. However, as with Europe in general, the Roma ethnicity is still seriously discriminated against and their culture is little understood. Today Transylvania is the most developed region in Romania, partly because of tourism and partly because of a stronger capitalist tradition prior to World War II. The presence of the German and Hungarian minorities has been a catalyst for Western influences in Transylvania since 1989. It is interesting to observe the differences within this small region: the South and South East are dominated by Saxon culture, the East and North East are more influenced by Hungarian culture, the North is more Slavic, and the South West different again. Try to visit a few older villages, where the people are generally very friendly. Nowadays, almost everyone in Transylvania speaks Romanian, though for many of the ethnic Hungarians -- about 20% of the population, but far more in certain areas -- Hungarian is actually their first language. Few native German-speakers remain, but in any sizable town you should easily be able to find people who speak at least moderately good English, French, or German. Transylvania is relatively easy to access, due to its relative economic prosperity, tourism industry and proximity to Central Europe. There are three main airports in the region. Cluj-Napoca International Airport  is located in north-western Transylvania. It's the largest airport in Transylvania and an emerging regional hub. Sibiu International Airport  is located in the southern part of Transylvania. Transilvania International Airport  is located in central Transylvania, near Târgu-Mureş. It has daily flights to/from Budapest with Wizzair, MALEV  and from Bucharest with TAROM. Very frequent trains link cities in Transylvania with Bucharest and major cities in all other regions of Romania. Check timetables on infofer.ro . You can find great and detailed road maps in any gas station throughout the country, in train stations and in most newsstands. These detailed road maps can lead you anywhere, without much guidance needed. Be careful though for secondary and tertiary roads are not clearly marked, so sometimes you have to ask for directions. People are usually very friendly and will help you get to the destination of your choice. Buses are becoming a popular means of transportation in Transylvania. Usually, they leave from train stations in major cities, and stop in the central area of smaller ones. As in all eastern Europe, hitchhiking is common and even a preferred way of transport for some locals. It is polite to leave the one who drives you some money, about 1-2 lei / 30min. However, people won't get mad if you don't leave anything and they might turn your money down anyway. Choosing the right spot for hitching increases your chances drastically- try to ask people on the street where to stand. Bicycles are a very convenient and eco-friendly way of getting around in Transylvania and this way you can observe the natural beauty and even visit the smallest and remotest of villages. Beware though that most circuits include large elevations, so you should be used to climbing hills. In remote villages you can always find locals who will sell you very cheaply some fresh produce: fruits, vegetable, dairy products, or even invite you for lunch. Racing bikes with narrow tires are not recommended though, even major roads have many defects and in the more remote areas you will travel on dirt roads, so a robust mountain bike is preferred. Mici - a symbol of Romania. To some locals it is like the sword to a samurai (but tastier). Ciorba de Burta - tripe (cow stomach) soup. Tastes better than it sounds! There aren't many Saxon restaurants, but if you find one you can explore it and post some info here. Lacrima Lui Ovidiu - A nice, sweet Romanian wine, available in supermarkets for around 20 lei. Dracula Beer - A Kitsch beer sold to foreign tourists, around Bran Castle as well as supermarkets, noted for its remarkably unsavory flavor. Horinca de Bihor, or other Tuica. This is a local brandy. Many locals brew their own natural and tasteful brandy. You can find it at locals (they will be happy to have you taste theirs) and in wine cellars. Transylvania is not a land of dangers lurking around each darkened corner. It has a relatively large number of police stations, so if anything goes amiss on your journey, help will be close by. You should beware of pickpocketing around busy tourist attractions and in heavily touristed towns, like Sinaia, there will be some con men out to prey on tourists. Beware of the "maradona". Police corruption has been reduced significantly and you would be better off being nice and friendly to police officers, rather than offering them money. If you feel like you are being mistreated by a police officer, ask for his superior. Maramures in the north, Banat in the south west and Crisana in the west are historically tied to Transylvania and can be a good extension of your trip to Transylvania. Moldova is popular for its monasteries and small villages. Dobrogea is where you can go to the Black sea coast. Bucharest is the capital of Romania and about 3 hours away from Brasov. In the south of Romania you can see the green Oltenia and the fieldy region of Muntenia. This article is an outline and needs more content. It has a template, but there is not enough information present. Please plunge forward and help it grow! This page was last edited on 30 September 2018, at 22:09. Text is available under [http://wikitravel.org/shared/Copyleft Creative Commons Attribution-ShareAlike 3.0] images are available under [http://wikitravel.org/shared/How_to_re-use_Wikitravel_guides various licenses], see each image for details. This site is owned, operated, and maintained by MH Sub I, LLC dba Internet Brands. Copyright © 2018 MH Sub I, LLC dba Internet Brands.